The Inaugural Division promises to offer thrilling competition as we see what our new City Clubs are capable of in their first season of Super League action! Atlanta – The Bashers brought their fighting spirit into the first Week of Divisional Play. It came down to the wire as Atlanta pulled off a last-minute victory over DC in the Inaugural Division. The teams spent most of the day battling back and forth for the lead with DC up 143 to 139 entering Zombies, the final game mode of the day. While both teams had a great showing, the Bashers were able to pull out a victory with a final score of 171 to 160. Will this be the beginning of a rivalry between the two City Clubs? Washington D.C. – The Conspirators put on a great show, making the Atlanta Bashers work hard for their victory. They matched their opponents brick for brick, but Atlanta pulled through in the final game mode of the day, Zombies. Don’t sleep on this City Club yet as they had 5 of their players on the “Top 12 Player Scores” of the day; Dimonade (3561 points), followed by HighOnPvP (3203 points), Buttyjumbo (2823 points), kitten_fire (2746 points), and UnicornNarwhal65 (2615 points). Can they come together and knock Atlanta out of the top spot? 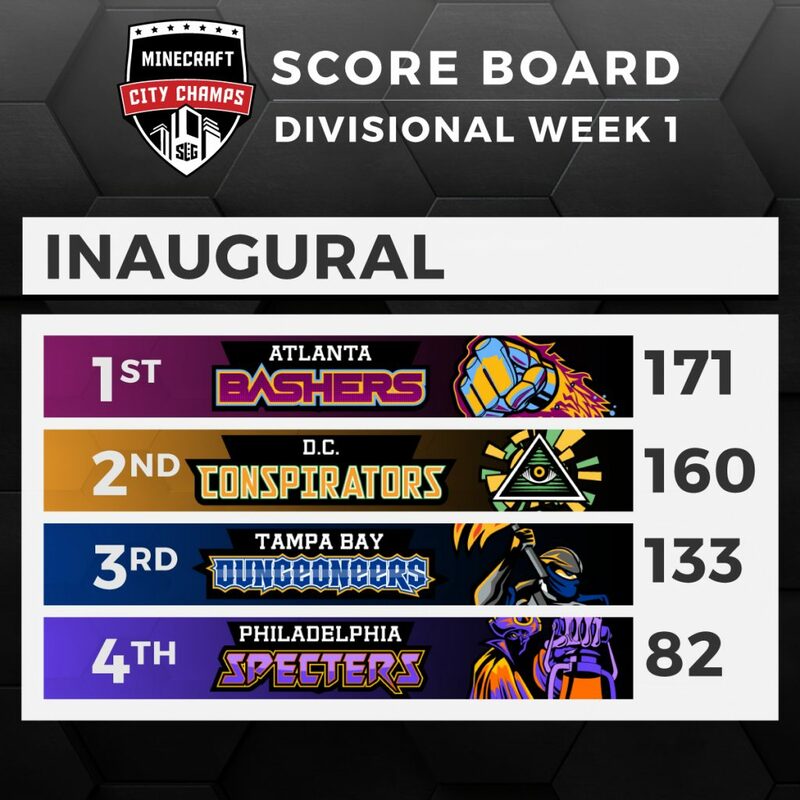 Tampa Bay – The Dungeoneers were on the hunt during Week 1 of Divisional Play in Super League’s Minecraft City Champs, taking third place in the Inaugural Division with 133 points. WolfBoy_Panther continues to be a leading force for Tampa Bay, putting up a solo player score of 2642 points. Will he rise as a leader for Tampa Bay and light the way to victory? Philadelphia – The Specters fought hard during Week 1 of Divisional Play in Super League’s Minecraft City Champs. Ultimately, Philadelphia had to settle for fourth place in the Inaugural Division with a score of 82 points. The Specters showed visible signs of improvement, with their B team tying for the third-highest wave in Zombies. Don’t sleep on this team just yet. It’s early enough in the competition for the Specters to the biggest comeback of this season of Minecraft City Champs. The Eastern Division promises to be an exciting experience as each team competes for the top spot. The action should be thrilling as this is one of the tightest divisions in Super League. 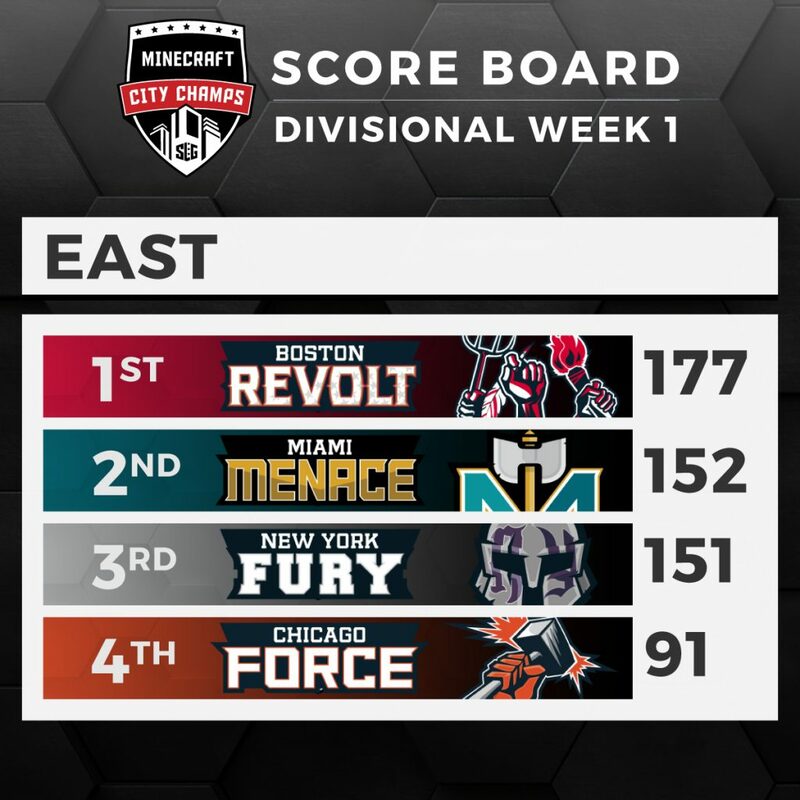 Boston – The Revolt came away with a wicked victory, scoring 177 points to win this week’s Eastern Division matchup. Thanks to the spectacular play of pocket_player (3777 points), HeyItzBuilder (3669 points), galuch (3640 points), changyskin (3564 points), TheSniperDuke777 (3562 points), GreyPuncher (3453 points), LuckyLiam7 (3445 points), aberdeen28 (3331 points), and Anttyk (3904 points) leading the Revolt to victory and dominating 9 of the Top 12 Player Scores. Who will lead their city next week? Miami – The Miami Menace and New York Fury battled it out for second place in the Eastern Division, and after a menacing battle with the hordes of Zombies, Miami pulled out the victory in the last moment by just 1 point! While the Menace do not have any individual players in the Top 12, their teamwork has been impeccable with Squad B, Squad E, and Squad D making it into the Top Teams list for the Eastern Division. The Menace are showing that teamwork makes the dreamwork! New York – The New York Fury look to step up their game as they seek to move up the standings in the Eastern Division and take the lead over the Menace next week. New York was led by Lord_of_Zeus, the #2 overall scorer in the Eastern Division with a smashing 3851 points, Spaceman0_0 (3541 points) and Entey_Laser_9000 (3475 points) also finished in the Top 12 as they show other players in their Division that New York is a true contender in the East. Can they bring the fury and come out on top for Week 2 of Divisional Play? Chicago – The Force fought hard during Week 1 of Divisional Play earning 91 points, a massive increase from their Practice week point total. Chicago’s performance was fueled by Squad B, who finished the day tied for third place in Team Scores. Chicago looks to step up their game as they seek to move up the standings in the Eastern Division next week. They may have finished Week 1 of Divisional Play in fourth place, but the competition isn’t over yet. If they can continue to show the growth they displayed between Practice Week and Divisional Play, they will be a Force to be reckoned with! The Central Division explodes with the return of the Dallas Dynamite leading the pack as they look to earn a 3rd straight Grand Final appearance. 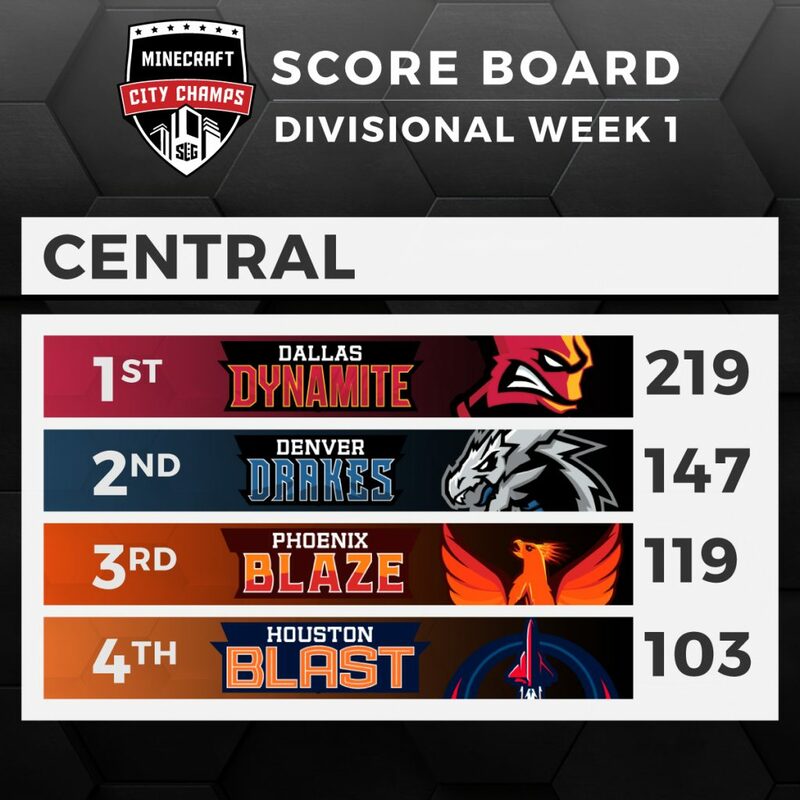 Dallas – The Dynamite brought the boom to our Central Division as they ended week 1 of gameplay in the top spot with 219 points. Players Aibach and Deoloch return the leaderboards sealing the top 2 individual scores in their Division with Dallas holding 5 out of the 12 “Top Player” scores in the Central Division. Are the LA Shockwaves in danger of losing their Minecraft City Champs dynasty to this explosive City Club, or will Dallas have their fuse blown out before the finals? Denver – The Drakes soared into week 1 of gameplay in the Central Division of Minecraft City Champs, chasing the Dallas Dynamite for 1st place. Scoring 147 points at the end of Week 1, the Drakes find themselves behind the explosive Dynamite by only 50 points. Can Denver show the rest of the Central Division what they’re made of or will the talent on the Dallas Dynamite be too explosive for the Denver Drakes? We’ll find out Saturday! 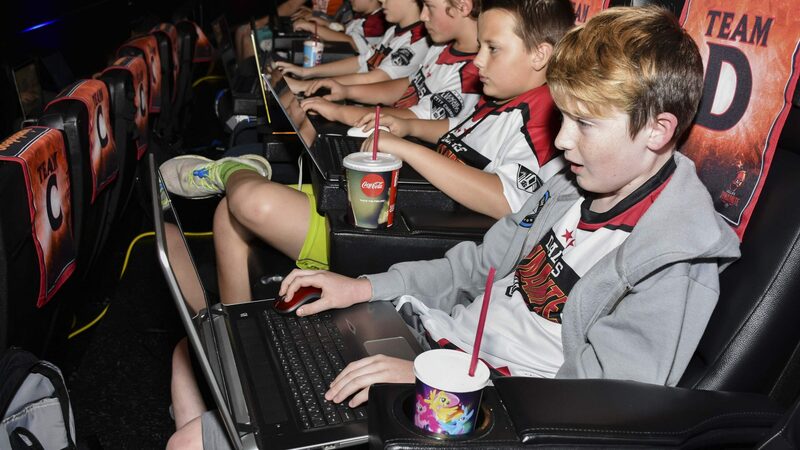 Phoenix – The Phoenix Blaze took the 3rd place spot in the Central Division of Minecraft City Champs with 119 points. The rest of the division should watch their back as the Blaze’s Squad A, B, and C show what they’ve got by earning impressive placement on the “Top Teams” list in the Central Division. With the right planning, practice, and teamwork the Phoenix Blaze can rise to achieve a fiery victory. Houston – The Houston Blast were not cleared for liftoff this week as they take the 4th place spot with 103 points in week 1 of Divisional Play. We had some starry performances from TimeDeo (4887 points), Super_Isi_99 (4458 points), and goldngamr (4080 points) taking 3 spots in our “Top Players” scores list along with Squad A sealing a spot on our “Top Teams” list for the Central Division. There is plenty of time left on the countdown clock for the Houston Blast to shoot for the moon. The Western Division excites everyone as the LA Shockwaves fight to keep their title of Minecraft City Champions. 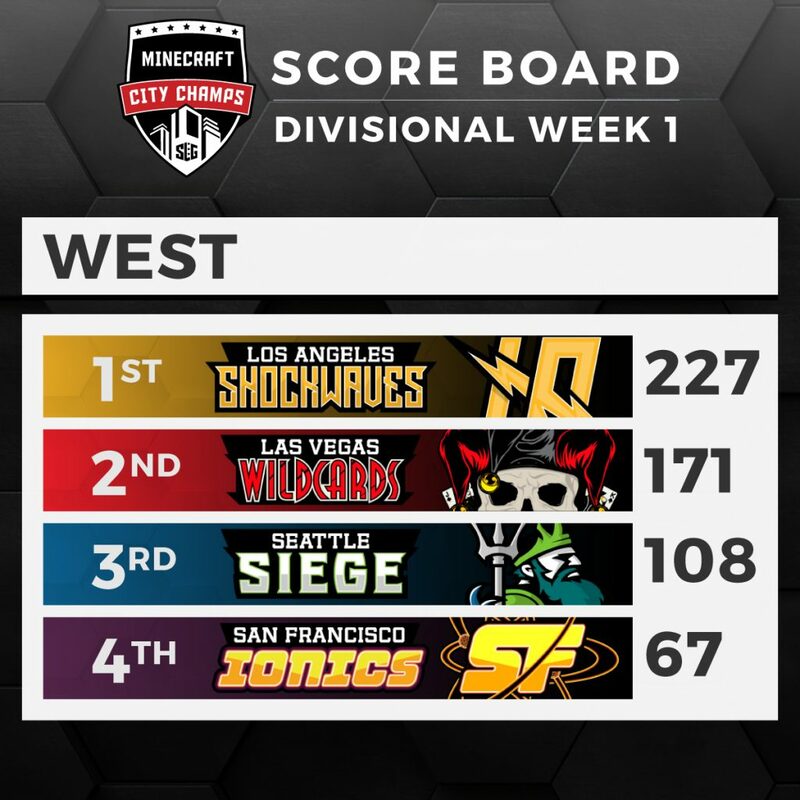 Los Angeles – The Shockwaves rocked the Western Division of Minecraft City Champs and took 1st place scoring 227 points in Week 1 of Divisional gameplay. The Richter scale went crazy with the performances that GR1MMM_CREEPER (5787 points), ItsRichYT (5474 points), TiNySlimEy (5315 points), DarthAJVader (5058 points), and GreenGamerz (4716 points) put on. LA’s quest for their 3rd straight Minecraft City Champs victory is underway, but with the Dallas Dynamite, Boston Revolt, and newcomer Atlanta Bashers putting up good fights in their divisions will the Shockwaves stay on top? Las Vegas – The Wildcards went for the jackpot as they attempted to beat out the LA Shockwaves at their own game in the Western Division, scoring 171 points during Week 1 of gameplay but falling short of the victory. Las Vegas has some hot shots playing at their table too, with 5 of the 12 “Top Players” in the Western Division hailing from the Wildcards. Players like ninjacraftable25, who came in 1st on our “Top Players” scores for the Western Division, are leading the charge and surely must be making LA sweat. Can the Las Vegas Wildcards go all in and take their winnings to the bank? We’ll see after Saturday’s match! Seattle – The Seattle Siege gave it their all in Week 1 of Divisional Play, placing 3rd with a score of 108 points. Seattle has shown improvement in their gameplay since Practice Day with Squad A locking down the 3rd place spot in our “Top Teams” list for the Western Division. This gives the Siege a solid foundation to build upon. Will they claim the trophy this season or will the Siege be fought off by the defending champs? San Francisco – The Ionics fought hard during Week 1 of Divisional Play, scoring 67 points and landing the 4th place spot in the Western Division. San Francisco looks to step up their game as they seek to move up the standings in the Western Division on Saturday. They’re definitely the underdog in their division, but with so much time left in the competition, anything can happen. If they pull it off and unseat the LA Shockwaves for the top spot in the Western Division, it would be a comeback for the history books. Don’t sleep on this team! Week 2 of Divisional Play will take place on May 5th as all 16 cities look to secure their ticket to the Grand Final! Remember, the scores from each week of Divisional Play will be added together with the highest scoring team from each division earning their right to play for the Nickelodeon Victory Party! Be sure to follow all the action at Tournament Central.